Born: 4 October 1876, Bergneustadt, Germany. Died: 2 July 1943, Hanover, Germany. 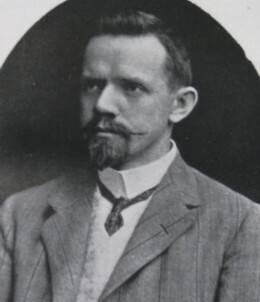 Hermann Bohle, electrical engineer, served an apprenticeship with the firm Siemens-Schukert and thereafter obtained a diploma in electrical engineering (with honours) at the Royal Technical School in Hagen, Germany. Proceeding to England he was employed at engineering firms in Birmingham and Walsall (on the outskirts of Birmingham), taught electricity at the Municipal Technical School in Birmingham and subsequently became chief lecturer in electrical engineering at the City of Bradford Technical College. He was a member of the Verein Deutscher Ingenieure and of the (British) Institution of Electrical Engineers. He married Antonie Knode, with whom he had two sons and three daughters. Early in 1906 Bohle was appointed as the first professor of electrotechnics at the South African College, Cape Town, but was also responsible for tuition in mechanical engineering. His inaugural lecture, on "Technics as a civilising power", was delivered on 22 March 1907. One of his first tasks was to order the necessary electrical apparatus for practical training. He was an excellent teacher and several of his students later occupied important positions in South African industry. From 1909 to 1911 he supervised evening classes in technical subjects presented at the South African College. These classes, which constituted a significant advance in technical education in South Africa, were later taken over by the Cape Technical College. In addition to his academic work he served as consultant for several electrical projects, including the Groote Schuur campus of the University of Cape Town, and was a member of the Advisory Board on Technical Education in South Africa. Bohle's most important publications were two books: Transformers: A treatise on the theory, construction, design and uses of transformers, auto-transformers and choking coils (with D. Robertson, London, 1911, 356p) and Electrical photometry and illumination: A treatise on light and its distribution, photometric apparatus, and illuminating engineering (London, 1912, 222p; 2nd enlarged ed., 1925, 427p). He also published a number of papers, including "Resonance applied usefully" (Proceedings of the Cape Society of Civil Engineers, 1907); "Polycyclic systems of current distribution" (1906), "The lighting of interiors" (1910), and "The conquest of the air" (1910) in Report of the South African Association for the Advancement of Science; "Modern transformer design" (1907) and "Magnetic reluctance of joints in transformer iron" (1908) in the Journal of the Institution of Electrical Engineers; "On lighting" (1908) and"Tests on incandescent electric lamps" (1908) in Illuminating Engineer; "A uniform system of weights and measures for South Africa" (1909) in the Journal of the Transvaal Institute of Mechanical Engineers; "Effects of uniformity and contrast on light" (1911), "The heating coefficients of rheostats and the calculation of resistances for currents of short and moderate duration" (1916) and "The theory of automatic regulators" (1917) in the Transactions of the Royal Society of South Africa; "Illumination" (1911), "The purification of water" (1912), "Small power stations" (1917) and "Electrification of railways" (1918) in the Minutes of Proceedings of the South African Society of Civil Engineers; "The electric kitchen for private homes" (1923) in the Transactions of the South African Institue of Electrical Engineers; and "Some graphical solutions of electrical engineering problems" (1928) in the South African Journal of Science. Bohle became a member of the South African Association for the Advancement of Science in 1906 and served on its council for 1909/10. In 1908 he was elected as one of the foundation Fellows of the Royal Society of South Africa. When the South African College became the University of Cape Town in 1918 he was elected as the first Dean of the faculty of engineering. He continued as professor of electrical engineering until his retirement at the end of 1936, when he returned to Germany. During his last few years at the university his lectures had become outdated. In 1929 the Technische Hochschule of Hanover, Germany, awarded him an honorary Doctor of Engineering (Dr Ing) degree in recognition of his teaching and research in electrical engineering and his promotion of German culture outside Germany. He has been described as a dogmatic and opinionated man (Phillips, 1993) and his views were characterised by strong German patriotism. He published three bundles of poems, Feierabend (1910), Germania (1911) and Weltanschauung, Begriffe und Ideen (1913). Cape Society of Civil Engineers. Proceedings, 1907, Vol. 5. Journal of the Transvaal Institute of Mechanical Engineers, 1909-1910, Vol. 8. Obituary: Hermann Bohle, MVDI, MIEE. Transactions of the Royal Society of South Africa, 1948, Vol. 31, p. xlvii. Royal Society of South Africa. Transactions, 1908-1918, Vol. 1, 2, 5 and 6. South African Association for the Advancement of Science. Report, 1906, 1910, 1911, 1918. South African Journal of Science, 1928, Vol. 25. South African Institute of Electrical Engineers. Index of SAIEE Transactions, 1909-1980. (Electronic file, SAIEE). South African Society of Civil Engineers. Minutes of Proceedings, 1912, Vol. 10.